The underbutt. The part of your booty that you can grab under. The part where the glute meets the hamstring. The part that sorta shows when your shorts are too short! Haha. You know what I mean?! 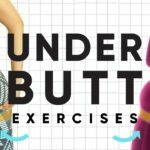 Here is an at home, equipment free workout video that you can do to target the exact underbutt area. This means we will be working a lot of hamstrings (biceps femoris, semitendinosis, semimembranosis) in order to give your booty (your gluteus maximus, minimus, and medius) a lift from underneath. We will be doing each of the following exercises for 1:30 each, no breaks!